Nano- to Micro-scale Metrology of pores and particles : research and analysis. that may be zoomed and panned. However they may take a few moments to load, and you may need to download an Adobe plugin. Lab-Tools performs contract analyses of Pore Size Distributions and Pore Volume using NMR Cryoporometry. The main technique we have developed for nano-scale metrology uses NMR Cryoporometry, based on physical thermodynamics (Gibbs equations), and employs Gas Adsorption and neutron scattering for primary calibration. We will make free measurements on two of your samples, so you can verify the technique at no cost to yourself. Contact : Dr. Beau Webber . NMR Cryoporometry (NMRC) is a novel pore size distribution measurement technique that we have developed at the University of Kent and at Lab-Tools Ltd. It makes use of the fact that small crystals of a liquid in the pores melt at a lower temperature than the bulk liquid. This is the Gibbs-Thomson effect : The melting point depression is inversely proportional to the pore size. A liquid is imbibed into the porous sample, the sample cooled until all the liquid is frozen, and then warmed slowly while measuring the quantity of the liquid that has melted. This data is converted to a pore-size distribution. J. Mitchell, J. Beau W. Webber and J.H. Strange. Physics Reports, 461, 1-36, 2008. doi:10.1016/j.physrep.2008.02.001 . Further information on Cryoporometry including equations. 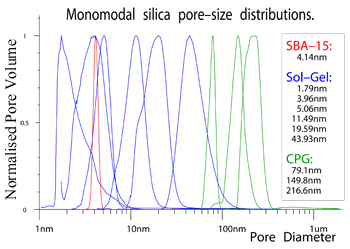 Figure 1: Normalised pore size distributions for selected porous silicas, as measured by NMR Cryoporometry. The intrinsic resolution of the technique is better than the red curve, for SBA-15, which is fully resolved. The Lab-Tools pore-size distribution measurement range extends from about 1nm to over 2µm. 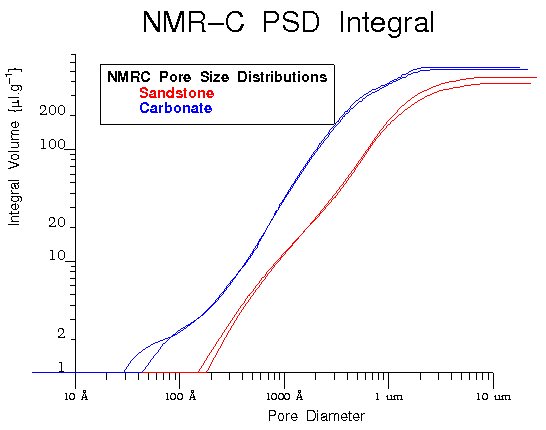 NMR Cryoporometry measures both the total pore volume and the pore volume distribution as a function of pore diameter. NMR Cryoporometry measurement costs are very competitive. Cost per sample depends on the pore-size range to be covered, and precision needed, but goes down markedly for multiple-sample batches. Two free pore size distribution measurements are normally available for you to evaluate the technique for your own samples. Please contact Dr. Beau Webber to discuss pore size measurements on your samples. Maximum sample size needed : enough sample to fill a tube 4mm dia. x 12mm : usually 30mg to 300mg, depending on density. for porous carbonate and sandstone rocks. 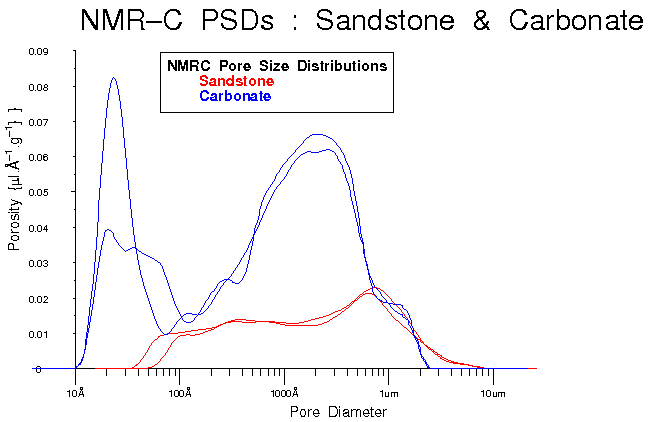 Note: the divergence in the carbonate data at low pore diameter corresponds to less than a 1μl.g-1 base-line error, as can be seen on the pore integral graph. With all these thermodynamic techniques, however there is increasingly a supposition that as atomic dimensions are approached, the calibration from the thermodynamics may change. Thus we have mounted a separate metrology program using neutron and X-ray scattering. These have the advantage that they are inverse techniques, by which is meant that the smaller the structure being observed, the larger is the scattering angle. Further, there is no existing reason to suppose that these scattering techniques are length-scale dependent. i.e. if one has a good calibration at one length-scale, it should also be good at all other length-scales. To transform a measured scattering to a metric of the structures in the sample, we create extended models of pore systems, and calculate the scattering using numerical integration. These show very good agreement with measured scattering, figure 4. Our existing measurements using sol-gel silicas have shown that while the thermodynamic techniques are in close agreement with the scattering measurements for dimensions above 10nm, below this dimension there appears to be an increasing divergence between the scales of the thermodynamic and scattering metrologies. Dr. Beau Webber has been awarded measurement time at the Institute Laue Langevin (ILL), on the D4 and D22 instruments, and this has enabled him to develop and verify his models. Dr. Beau Webber was recently awarded further measurement time (as first user) on the excellent new wide-scattering range ISIS Target Station 2 instrument NIMROD, and 17 porous samples were measured on this most successful run, with very pleasing preliminary results. Simulation models are being run to match the results, and the models, results and conclusions will be presented in a paper. 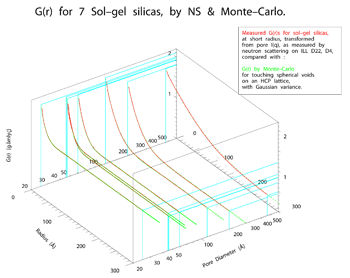 Figure 4: Fully density corrected radial distribution function measured for 7 sol-gel silicas (red lines), compared with that calculated for extended arrays of pores with Gaussian variance (green dots). Lab-Tools are based at the Canterbury Enterprise Hub at the University of Kent, U.K. The analytic and research labs have recently moved to new purpose designed premises outside Canterbury, near Ramsgate. One of our main strengths is the range of characterisation techniques we can offer using Nuclear Magnetic Resonance, to study liquids, solids and structured matter. We have made physical analysis measurements for a number of international companies, including BP, Shell, Unilever, Coates Lorilleux, Lafarge Braas, LCT in New Zealand, IFP in Paris and Schlumberger in the USA. Universities that we have worked with include Kent, Heriot-Watt, Leeds, Leicester, Imperial College, Lancaster, Nottingham Trent, Rice and Texas in the USA, plus a number in Europe. For more information : E-mail me : J.B.W.Webber@kent.ac.uk, see : my publications , go to my research home page. Also, see my Thesis. Content, design & creation Dr. Beau Webber 2005.